When I think of comfort food, bread pudding is the first to come to mind. Warm and soothing, it's a childishly easy concoction of eggs and milk. A dish of innocence and assurance, it's one of the first recipes I learned to make with my grandmother. We'd toss in a handful plump raisins and dust it with cinnamon sugar to make a crackly crust. She'd pull it from the oven, all puffy and golden; cut with a long handled spoon, it released steamy, satisfied sigh. On dreary nights, we'd eat it for dinner, especially on Sunday after we were all stuffed with the big midday family meal. (She called it supper; today we'd say lunch.) Leftovers were the best at breakfast, a thick slice fried in butter and drizzled with syrup, like French Toast. When I first moved to Minneapolis from my home in NJ, I worked in a warehouse office building across the street from the old New French Cafe. On Friday my partners and I would feast on bread pudding made of left-over croissants; quite beautiful thing - so airy, so rich, so right with bowls of foamy cafe au lait. 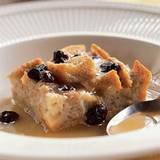 Bread Pudding can be sweet or savory; serve it for breakfast, lunch or dinner, snack or dessert, it's a sure bet, any time of day. It makes luscious use of the artisan bread I hate to throw away, muffins, croissants, whatever. To turn it savory, use herb breads and add a handful of shredded cheese, chopped meat and left over vegetables. It comes together in a wink and bakes up on it's own in about an hour, leaving me to attend to other tasks (maybe even read the paper). What more can a tired cook ask? Butter casserole or deep baking dish. In a medium bowl, beat together the milk, eggs, sugar, vanilla, cinnamon and nutmeg. Pour this over the bread. Set aside and allow to soak at least 1 hour or cover and refrigerate over night. Preheat the oven to 350 degrees F. If the dish has been refrigerated, allow to come to room temperature. Sprinkle with cinnamon sugar and bake until the edges are firm but the inside is still soft and moist, about 40 to 45 minutes.